As promised, Apple's next-generation OS X Yosemite Mac operating system is now available for download through the Mac App Store, bringing with it a host of enhancements like iOS Continuity, a redesigned UI, iTunes 12 and more. Following an announcement that it would be available later Thursday, OS X Yosemite is live in the U.S. Mac App Store, with international availability expected soon. Upgrade your Mac to OS X Yosemite and you'll get an elegant design that's both fresh and familiar. The apps you use every day will have powerful new features. And your Mac, iPhone, and iPad will work together in amazing new ways. You'll also get the latest technology and the strongest security. It's like getting a whole new Mac —for free. Among the feature additions highlighted by Apple is a new "flat" redesign that borrows from the aesthetic first introduced in iOS 7. The enhanced look includes transparencies, minimized skeuomorphic assets and reduced shadowing. Apple also points out Continuity features that let users place and receive phone calls, send and receive SMS texts and create instant hotspots with a connected iPhone. In addition, a new AirDrop version allows file transfers between iOS devices and Macs, negating the need to send larger documents through email. For sending huge files to other people, Apple also includes a new iCloud-based email option called Mail Drop, which lets users attach documents up to 5GB in size. 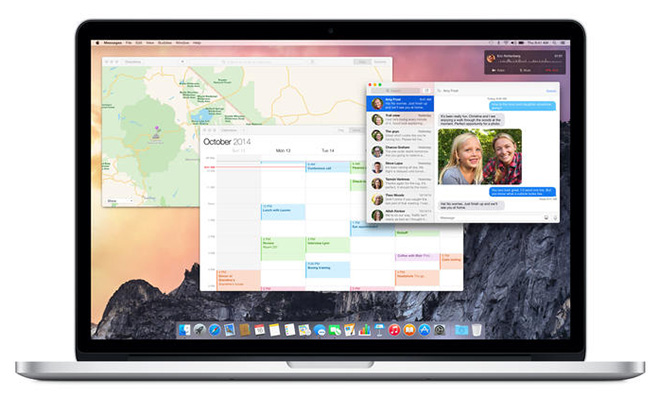 Users can download OS X Yosemite for free through the Mac App Store or via Software Update. The update comes in at 5.16GB and is compatible with OS X 10.6.8 or later.